It wasn't so long ago that, in the view of much of Canadian officialdom, the huge emptiness that is this country's northern third was little more than a vast wilderness, or nowhere land. Rules and regulations don't apply when you're nowhere, and that's why a blind eye was turned to some of the worst environmental degradations inflicted on some of the planet's most ecologically fragile real estate. When mines were shut down, when exploration camps were abandoned, when military installations were mothballed - whatever the situation was on the last day of their usefulness - that's the way they were left to rot and be forgotten. But in the Arctic, where a human footprint on the tundra can take years to vanish, nothing is easily swept under nature's carpet. Today, the federal government estimates there are more than 600 sites across the north containing waste that is unsightly and/or potentially dangerous to humans. A good chunk of the $100 million earmarked in 1991 as the Arctic Environmental Strategy portion of Ottawa's $3 billion Green Plan was spent cleaning up these sites. 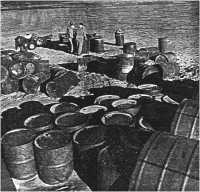 One of the first projects approved was the cleanup of a massive gravesite of hundreds of thousands of Second World War era 45-gallon fuel drums abandoned at Coral Harbour in the Northwest Territories. Leftover fuels were siphoned off during the multiyear project and the barrels are being crushed and shipped out. Pelly Lake in the north central Arctic became a base camp for aerial mapping surveys during a busy, three-year period in the 1950s. One of the more benign sites ordered cleaned up under the Department of Indian Affairs and Northern Development's Action on Waste program, the abandoned mess in the midst of pristine Arctic wilderness nevertheless comes as a shock. More than 400 fuel drums, some still filled but rotting and leaking their contents, lie spread out in a jumble, containing such toxic concoctions as gasoline, oils and tar. Strong winds have scattered empty drums over a wide area, while kitchen utensils unfinished jars of foods, empty bottles and cans and camp rubbish lie in tumbled abandon. Piggy-backing on their expedition to bring home the remains of a Mosquito bomber that went down at Pelly Lake in 1956, a group of Windsor aircraft salvagers helped Paul Squires, a Yellowknife environmental consultant under contract, with his cleanup of the site. Barrels still containing fuels and liquids were consolidated. The loaded drums will be sent to Yellowknife and beyond for disposal. Getting rid of the non-toxic debris - including empty barrels, scattered camp ruins, a bulldozer and jeep - will have to wait for future government funds. The elevated Pelly Lake site overlooks the vast, open lowland basin of the Back River, one of the biggest barrenland streams. Nearby and to the north is the Queen Maud Bird Sanctuary; it's an important summer home to countless geese, tundra swans and sandhill cranes. To the immediate south is the Thelon Game Sanctuary, home ground for nearly half a million Beverly caribou, thousands of musk oxen and other big-range animals that live happily far removed from human encroachment. Cleaning up Pelly Lake and the other ugly signs of human inhabitation should help ensure there are no toxic surprises in the future of their otherwise untouched homelands. This article copyright the Windsor Star 1996. I have tried to contact the Windsor Star in an effort to get permission to use this article in the web, but have not had any reply. If you object to this article or any of the pictures shown on this page being available on the web, please contact me.